About 196,000 Explorers are being recalled for a steering issue, one of four recalls announced Thursday by Ford. 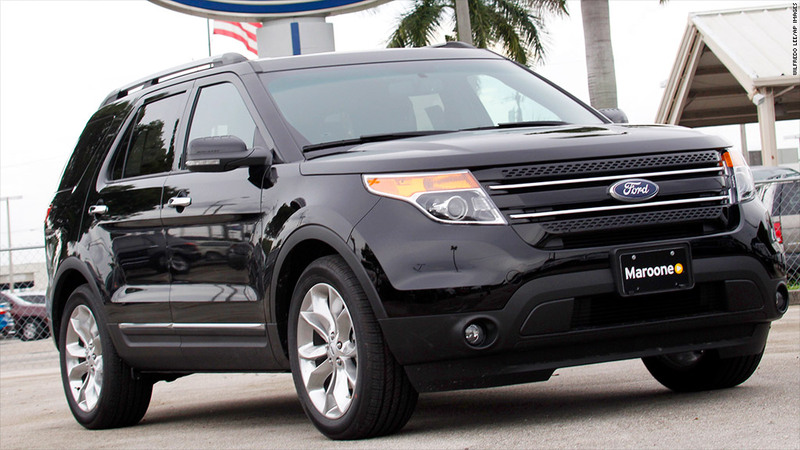 The steering issues impact 915,000 Ford Escapes and Mercury Mariners from model years 2008 through 2011, and about 196,000 Ford Explorers from 2011 through 2013. Faulty sensors and electrical connections could cause the vehicles to lose power steering, making steering more difficult and increasing the risk of a crash. Not all vehicles have the same issue, Ford (F) said, and the fix involves either replacing a part or a software upgrade. Ford is aware of 20 accidents and eight injuries that might be related to the steering problems. The automaker is also recalling 196,600 Taurus sedans from model years 2010 through 2014. Corrosion due to road salt could cause the license plate lamp to short circuit, overheat and possibly cause a fire. It believes 18 fires are connected to the issue. In one case, a driver put out the fire by hand and was injured, the company said. Ford said the fix would replace the part. The recall applies to vehicles in 20 states and the District of Columbia where road salt is used to treat roads in winter storms. The fourth recall involves floor mats that can be improperly installed and come in contact with the accelerator pedal. It involves about 82,500 mats available for the 2006 to 2011 Ford Fusion and Mercury Milan, Lincoln Zephyr and MKZ. Two accidents are allegedly connected to the problem, Ford said. Automakers have come under scrutiny since General Motors (GM) announced a safety issue it had not publicly disclosed for 10 years. That ignition switch issue has been connected to at least 13 deaths -- and is likely responsible for more, federal regulators say. GM has recalled nearly 16 million vehicles this year. Fiat Chrysler CEO Sergio Marchionne said at a company conference earlier this month, "I think you're going to see a heightened level of sensitivity across all automakers on this issue." Also earlier this month, Ford included 692,500 Escapes from model years 2013 and 2014 as part of a recall for problems with the side airbags and door handles.